ONLY DIY TEST KIT ANALYZED BY AN ACCREDITED LABORATORY! 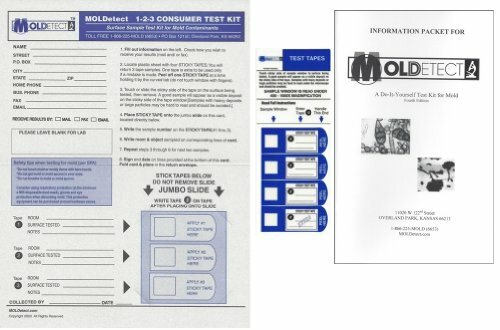 This reliable DIY mold test kit helps to confirm or rule out indoor mold growth and identify the mold types present (including black/toxic mold--Stachybotrys). Using custom-made sticky tapes, the surface tape lift method is able to detect all spores. This method is more reliable than slower culture methods that require growth on culture media (culture media may or may not have proper nutrients for the relevant molds to grow). Samples are analyzed by highly trained Lab Professionals using direct microscopy. Results are sent back 2-3 days after receipt in the lab. An Information Booklet is also provided with potential health effects from the spores identified, how to prevent mold, cleaning tips, and additional resources. Excellent customer service.Please see website: MOLDetect.com. If you don't see any visible mold you can collect dust from a horizontal surface that hasn't been recently dusted in the area of concern. To do this you take the tape lift and touch it and/or drag it on dust so that there is a visible deposit of dust on the tape window. The idea is that if there is a significant mold contamination issue the mold spores will typically become airborne and then settle on horizontal surfaces. We then analyze the dust sample and let you know if there are significant amounts of abnormal 'indicator' spores which typically are only found inside when there is a indoor mold contamination. One other place you can test to see if you have any abnormal mold in your home is the furnace filter (if you have central air). This is ideal because if there is significant mold in the home the spores will become airborne and eventually make their way through return air ducts and pass through the furnace filter. Testing the furnace filter is more of a general screening of the home but is a good place to test if you don't know where there is a source of mold. Now Analyzed by an AIHA-LAP EMLAP Laboratory!! Only Tape Kit Offering Accredited Analysis! If you have any questions about this product by MOLDetect, contact us by completing and submitting the form below. If you are looking for a specif part number, please include it with your message.